Welcome to Aero Aviation Academy – The Premier Flight Training School in Chicago. Ready to schedule you Introductory Flight? Have any questions? Give us a call or send us an email. Starting flight lessons is as easy as setting up an appointment, your first flight will be with you at the controls. 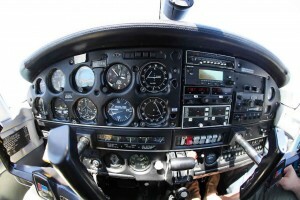 Set up an introductory flight today so you can have a feel for what its like to fly an airplane. If your goal is to become an airline pilot or just fly for fun; the Private Pilot Certificate is the first license you’ll be working towards. Our frequently asked questions page answers some of the most popular questions asked about flight training. "AERO AVIATION ACADEMY has over a decade of flight training experience!" Aero Aviation Academy at Chicago Midway Airport caters to all aspiring and certified pilots. Whether your goal is to fly part time for recreation or to pursue a career in aviation, the highly trained staff at Aero Aviation Academy have a program designed to meet your needs. Located at Midway Airport in Chicago Illinois, we offer an ideal location for beginning your aviation endeavors! Uniquely, Midway Airport is able to provide you with the experience of working with courteous and professional air traffic controllers in a busy radar controlled environment. The experience and confidence gained here will prepare you to flying into any busy airspace in the U.S. For those that want to practice flight maneuvers, there are many open areas around Chicago Midway Airport. Another benefit of flying from Chicago Midway Airport is the breathtaking view of Chicago's beautiful skyline, which is best seen from high in the sky. Give Aero Aviation Academy a call and talk to our experienced flight instructors on how we can give you the best experience of your life. Take the first step to becoming a pilot by taking an Introductory Flight Lesson. You’ll take control of an aircraft with a certified flight instructor around the Chicago Land Area. Schedule permitting, fly today! Give us a call today to schedule your flight. Starting flight lessons is as easy as setting up an appointment, your first flight will be with you at the controls.